Jonesboro, AR — Parents, teachers, administrators, school board members and other education advocates will celebrate the success of Northeast Arkansas’ public schools and discuss students’ needs for the future Tuesday, March 6th at 5:30 pm at Jonesboro High School (310 Hurricane Drive, Jonesboro, AR 72401). Local members of Arkansans for Quality Education and leaders are working together to plan the education forum. Educators from Jonesboro, Paragould, Harrisburg, Newport and Lawrence County school districts will each share stories of the exciting things happening in their buildings. Jonesboro Superintendent Dr. Kim Wilbanks says it will be an important opportunity for the community to learn specific ways Northeast Arkansas school districts are improving student achievement, and how they can help to ensure successful strategies are implemented statewide. The public is invited and encouraged to attend. Heavy appetizers will be served at the event. Arkansans for Quality Education formed to push for proven, consensus-based education reform at the Capitol. Its members include the Arkansas Association of Educational Administrators, Arkansas Education Association, Arkansas Parent Teacher Association, Arkansas Opportunity to Learn Campaign, Arkansas Advocates for Children and Families, Arkansas School Boards Association, Arkansas Rural Education Association, Arkansas Citizens First Congress, and Rural Community Alliance. Springdale, AR — Parents, teachers, administrators, school board members and other education advocates will celebrate the success of Northwest Arkansas’ public schools and discuss students’ needs for the future Thursday, February 8th at 5:30 pm at Don Tyson School of Innovation (2667 Hylton Rd, Springdale). Local members of Arkansans for Quality Education and leaders are working together to plan the education forum. Springdale Superintendent Dr. Jim Rollins says it will be an important opportunity for the community to learn specific ways Northwest Arkansas School Districts are improving student achievement, and how they can help to ensure successful strategies are implemented statewide. Heavy appetizers will be served at the event. 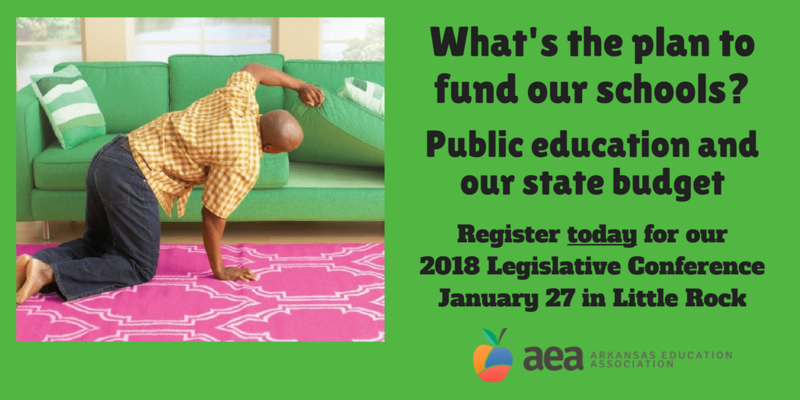 All AEA members are invited to join us at AEA Headquarters in Little Rock on January 27, to learn about the state budget and how educators can stand up for their students, their profession and their schools. 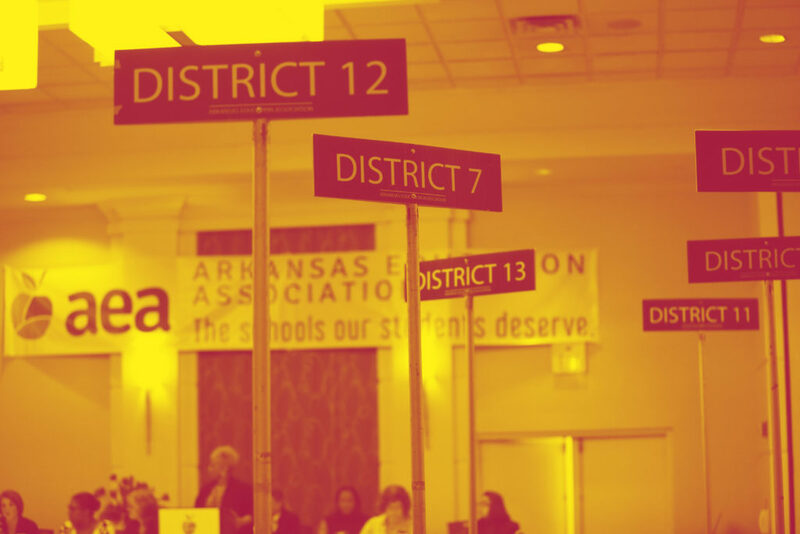 AEA members support students every day, and lawmakers need to hear from experienced professionals during the budget process and when they are drafting new laws that affect education in Arkansas. The conference is free for AEA members but registration is required. The Representative Assembly is where Arkansas Education Association members set policies, priorities and the direction of AEA business. At the RA delegates from local affiliates propose, debate, and take action on new business items for the Association. They also vote on proposed amendments to the Constitution and Bylaws. The Representative Assembly (RA) consists of delegates representing local affiliates. These delegates are elected by their local association and represent preK-12 Educators, including Education Support Professionals, Student Members, Retired Members, and other segments. The RA will be held on November 3-4, following the Professional Development Conference. Reminder! AEA provides PCSSD school buses as shuttle service for PDC participants. To access the shuttle service, you need to park in the Clinton Center parking lot off of Dean Kumpuris Street 30 minutes to an hour before the beginning of your workshop. You can also park at the Statehouse parking deck (at 2nd and Main St.) or the Robinson parking deck (under the DoubleTree Hotel) for a discounted rate of $6 per day (NO in and out). Throughout her career, Jahana Hayes has been honored time and time again for her unwavering dedication to her students inside and outside the classroom – a commitment Hayes inherited from the teachers who saw in her the potential to overcome the abject poverty that surrounded her childhood. The Arkansas Education Association is focused on ensuring that every student has a caring, qualified and committed teacher. To help educators be their best, we host an annual professional development conference in Little Rock. Our conference is the most comprehensive professional development conference for educators in Arkansas. This year, the AEA Professional Development Conference will host some of the most innovative, interesting and relevant workshops for Arkansas educators. Conference participants will explore: new strategies to reach all students, learn new approaches to teaching a diverse array of content areas and much, much more! Join us along with hundreds of educators from across Arkansas on Thursday November 2nd and Friday November 3rd at the DoubleTree Hotel in downtown Little Rock as we come together to create effective and empowered educators. This year’s conference hotel is at the downtown Little Rock DoubleTree, Robinson Theater, and additional locations in Little Rock. Visit our event page to learn more and register HERE through October 31. We also still need facilitators to help out at the conference. If you are interested contact Hannah via email at shynes@aeanea.org or call 501-425-2626 for additional information.